As of early July, the emerald ash borer (EAB) has been detected in 76 of Kentucky’s 120 counties (Figure 1). It occurs throughout some of the earliest infested counties (red and yellow on map) but is present only at low levels in scattered locations in other counties (green on the map). 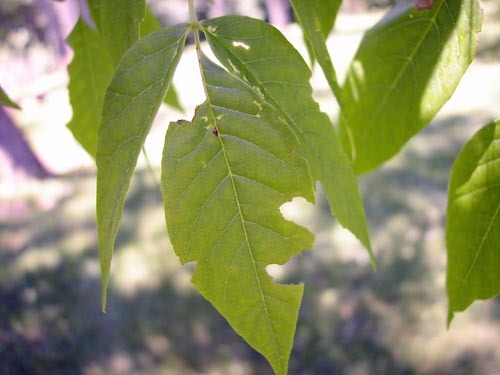 EAB usually has to be in an area for several years before signs of infestation become noticeable. Figure 3. Notches in ash leaf margins made by emerald ash borer adults (Photo: Lee Townsend, UK). Adult EAB feed, mate, and lay eggs from June through August. They are most active on sunny days when the temperature is above 77oF, resting on foliage (Figure 2) or in bark crevices when weather is overcast or rainy. The beetles can live for 6 to 7 weeks, chewing distinctive notches into the edges of ash leaves as they feed (Figure 3). 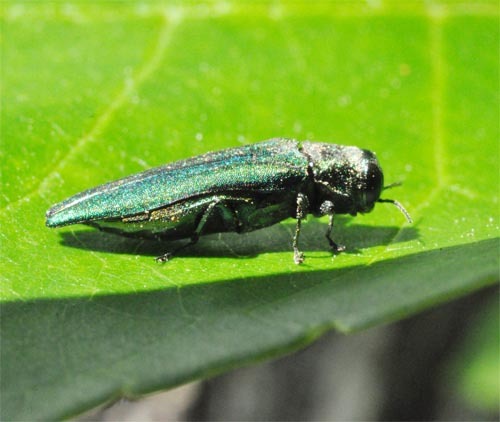 EAB adults respond to sight and smell in the search for ash trees and mates. Typically, females lay somewhere between 40 and 70 eggs, singly or in small clusters in bark crevices along the trunk and major branches, as well as on exposed roots. Eggs hatch in 1 to 2 weeks. Larvae chew through the surface of the egg that is against the bark and tunnel directly into tree phloem and outer sapwood, where they will feed until fall. Ash trees often die within 1 to 3 years of infestation, beginning in the crown and progressing down to the trunk. Infestations on small diameter trees frequently begin on the main trunk. Flight range of females determines the local dispersal rate. Lab flight tests determined the median capability of females was just about 2 miles. Twenty percent could fly greater than 6 miles; 1% were able to travel about 12 miles. Naturally, many factors affect flight behavior, but EAB local dispersal will result in a steadily expanding range from a newly infested site. Unfortunately, human transport is responsible for moving this borer well beyond its inherent capability.